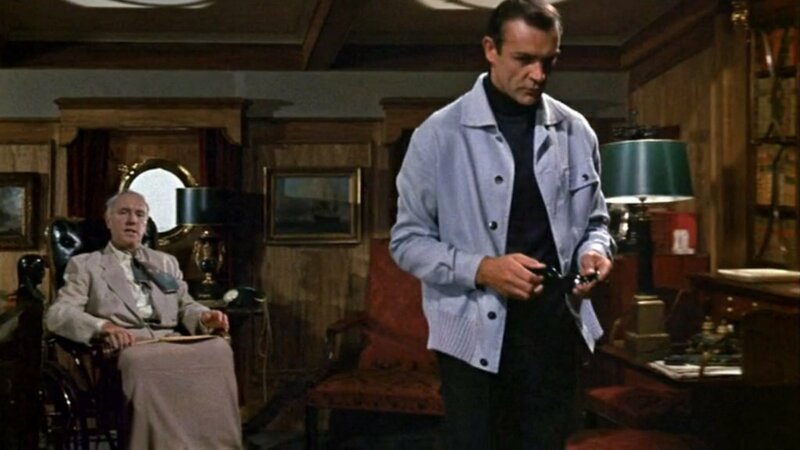 Sean Connery’s 1964 film Woman of Straw served as the source of most of his tailored clothing in Goldfinger. 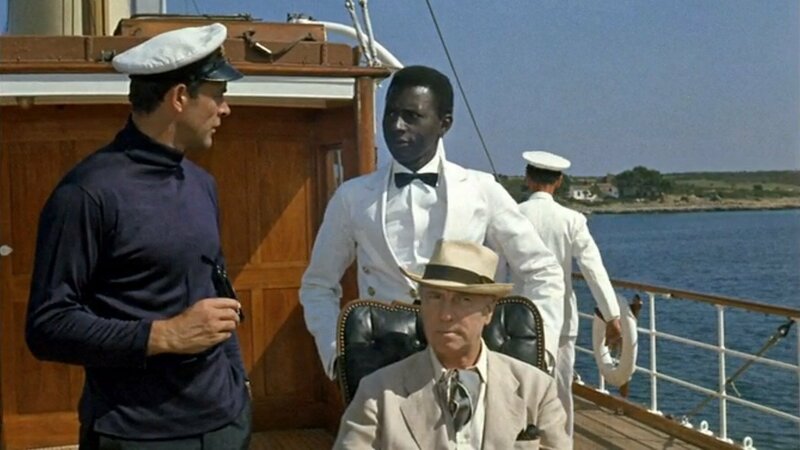 However, most of his casual clothes in this film didn’t have the honour of being featured in a Bond film, and a pastel blue blouson and a navy polo neck that he wears at sea near Majorca did not find their ways into Goldfinger‘s wardrobe. The cotton blouson has six large buttons down the front to mid-hip-length. It has a large turn-down collar that’s almost as tall as the polo neck underneath and a wide knitted band at the bottom. The front of the blouson has a patch pocket with a buttoned-down flap on the left side of the chest. The shirt-style cuffs are rounded and fasten with a single button, and the sleeve has a pleat at the cuff attachment. There are six braids down the side of the blouson under the sleeve, similar to what might be found around the cuff of a military uniform jacket. The braids are the same pastel blue colour as the blouson. 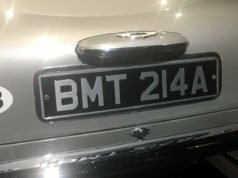 The blouson’s buttons are shiny grey, likely made of plastic. Connery’s blouson looks dated today, first because of the pastel colour and second because of the banded hem. In another light colour, khaki or grey would be easier to wear today. Darker colours like navy and black would be even easier to wear today. If compared to Roger Moore’s pastel blue leisure suit in Live and Let Die, this jacket still looks considerably better. The banded hem on this blouson is a classic and timeless style, though it isn’t a popular style today and gives a jacket a vintage look. 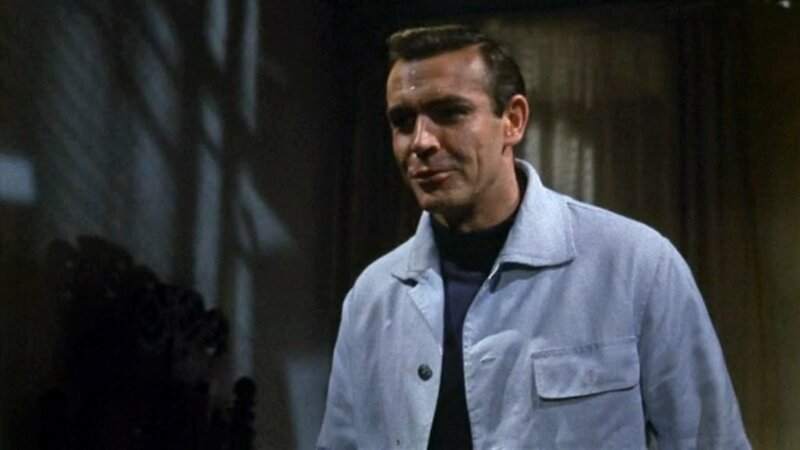 Under the blouson, Connery wears a navy polo neck—also known as a roll neck or turtleneck—in a smooth interlock-knit cotton that has the perfect look on a boat, though it’s a little too perfect when paired with his white peaked cap. The knitted top has a close fit and a V-cut vent at each side. Connery’s trousers are charcoal wool with a flat front and narrow, tapered legs. 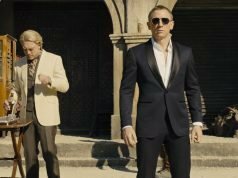 These could be the same charcoal trousers that Connery wears with his casual outfits in Goldfinger, such as his golf outfit and with his black polo and V-neck jumper. 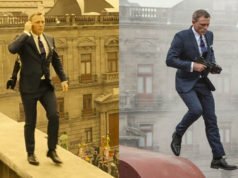 Because the polo neck drapes smoothly over the top of the trousers, this means that he likely does not wear a belt with the trousers, just like with his trousers in Goldfinger. Connery holds black sunglasses, but he does not wear them. I think is the mix of the color and the piece. A pastel blue jacket (blouson) is really dated. But a dress shirt of this color is still a clássic and very timeless piece. Am i right? Have you read the new Turnbull and Asser biography by James Sherwood? You blog is quoted in it on several occasions! I have not read it yet since it’s not available in New York yet. Thank you for letting me know what my blog is quoted in it! I have a indigo blue blouson from H&M it has a banded hem. If H&M still do a banded hem so it mustn’t be too outdated a look in general. But many of my blousons have a self band like Craig’s suede Matchless blouson. Not many men these days wear wool slacks with a casual blouson jacket. Unless it is for work in a business casual setting maybe, you wouldn’t see it in a purely leisure outfit.